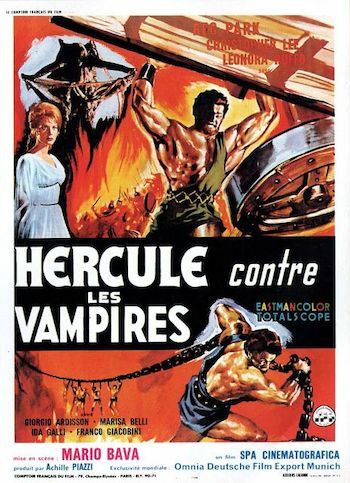 A fun and colorful film, Hercules in the Haunted World gloriously features Reg Park, one of our beefiest Hercules (his pecs are the size of a mere mortal’s head) and whose acting consists of standing around talking in a dubbed monotone, while periodically swinging giant papier-mâché stones over his head. British horror legend Christopher Lee also shows up as the evil King Lico. Obviously he lost some kind of bet. Hercules and life partner Thesus arrive at the kingdom where Herc’s girlfriend, Princess Deianira, resides. The queen has died and even though Deianira was supposed to assume the throne, her kindly uncle with the evil haircut (Lee) has taken over for her because she is sick. With his bowl shaped hair and dark clothes, it doesn’t take a genius to see that Lico is up to no good and is in league with Pluto. Of course, Hercules’ smarts are all in his massive arms and not his head. So when he’s told that to lift a curse afflicting Deianira, all he has to do is go down to Hades and get a magic rock that Pluto has, he tells Thesus to fire up the magic ship and make for Hades. Even though Herc encounters obstacle after obstacle, he meets them all with gritty determination. I’m assuming that Reg Park’s limited emotional range (it vacillated from muscleman pose to sticking his jaw out to thrusting his pecs in my face) comes from a steely confidence in the face of a crazy suicide mission and not just the fact that his acting background was being Mr. Universe three times. Hercules in the Haunted World had many memorable moments: Christopher Lee being dubbed by someone who surely wasn’t him, Medea periodically intoning some vital bit of information in a voice that reminded me of Jean from the Freedom School in Billy Jack, and even Thesus wussing out and falling into a lava pit to his death, only to reappear unharmed moments later with his new girlfriend Persephone, but for true Hercules fans, the hunky highlight is when Hercules fell out of an evil tree! There he was climbing up this big, nasty tree trying to retrieve a golden apple when all of a sudden there’s sparks, lightning, and explosions like you usually see up in the tops of really, big, villainous trees and poor old Herc is taking a header toward the ground below! He survives falling out of the tree (he is Hercules after all) and secures the apple with an assist from Zeus. The women who were watching the apple tell him good job, but while you were flopping down the beefcake tree and hitting every branch your friends were being harassed by a rock guy named Procrustes! Procrustes likes to cut and stretch everyone to fit in his beds. Hercules confronts Procrustes and we get one of our many guffaws as we see a guy in a really soft, foamy, rock suit lurching around, his voice sounding like an old, sinister computer! Hercules has to climb over lava pits, dive into fire and avoid chained up maidens as he makes his way to this glowing rock that Pluto has. Once he gets it, the action and fantastical adventure is only beginning! Director Mario Bava (Planet of the Vampires) brings his signature style to a lot of this movie, especially regarding the use of colors in his lighting. He’s able to shoot scenes in reds and blues that give things an eerie, otherworldly feel. Perhaps even more importantly, his inventive use of lighting also allows him to mask the cheap sets to good effect. The plot didn’t always make much sense as it charged from one action scene to another and the pacing of the movie was strange to say the least (characters stand around talking about what they have to go and do, then they do it, then they talk about what they have to do next and go and do that and so on throughout the film), but Bava smartly never gets bogged down in one location and the rapid fire nature of things combined with the unique visuals make it an enjoyable muscle stud romp despite the questionable story, the laughable attempts at acting, and the high school play sets.